Desert Essence Organics Coconut Hand and Body Lotion is an lotion that uses tropical oils and extracts to help skin refresh and renew. After use of this pure formula, skin looks and feels silky. It is lightly scented with tropical coconut oil. 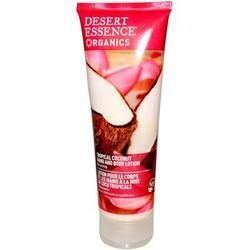 Desert Essence Organics line is 100% Vegan and is wheat and gluten free. It has no parabens, no sodium laurel/laureth sulfates, no phthalates, no artificial fragrances or colors, no silicones, no EDTA, no glycols and no petroleum based ingredients. Cruelty Free and biodegradable.